Two excellent strikes by Ryan Fenech and Hamza Barry gave Valletta a 2-1 win over leaders Birkirkara in today's top-of-the-table clash. Birkirkara, seeking a 14th consecutive league, produced a lively performance, especially in the second half when they hit back strongly to equalise after falling behind, but the champions ultimately fell to those two clinical finishes by the Valletta midfielders. With this win, Valletta have cut the gap on Birkirkara to three points, in the process boosting their title challenge. Andre Paus, Valletta's newly-appointed head coach, handed a debut to Georgia goalkeeper Nukri Revishvili and Nigeria-born forward Abayomi Owonikoko. Birkirkara were missing two played, Edward Herrera, who was out with a thigh injury, and Joseph Zerafa who was serving a one-match ban. The game was off to a quiet start but a defensive mistake by Valletta almost gifted Birkirkara an opener after 10 minutes. Steve Borg appeared to mishit his clearance and Brazilian forward Jhonnattann pounced before sending a through-ball to Shola Shodiya Haruna but the unmarked Nigerian striker fired wide. Birkirkara paid dearly for this miss as Valletta took the lead on 18 mi Reprieved, Valletta went up at the other end and scored on 13 minutes, Ryan Fenech rifling a fierce shot that caught Justin Haber by surprise. Birkirkara responded replied immediately. Gareth Sciberras freed Ryan Scicluna whose diagonal run into the box evaded the attentions of the Valletta defenders. Scicluna was clear at the far post but his effort was pushed away Revishvili. The game remained tight with the two teams careful not to give anything away. 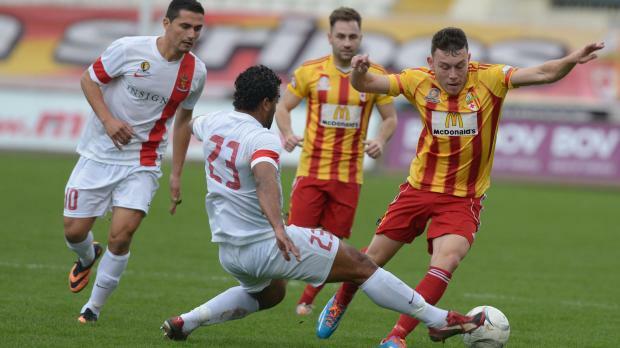 Birkirkara's efforts to find an equaliser were repelled by Valletta who threatened to double their advantage. Nafti's cross-shot from a right-wing free-kick soared into the six-yard box but Jonathan Caruana headed the ball over the bar. At the other end, Nikola Vukanac nodded wide from Paul Fenech's free-kick. Birkirkara had a good chance to equalise in the closing stages of the first half. Haruna's pressure unsettled Caruana who recovered to dispossess the Nigerian but Fenech flashed in only to send his shot over the bar. For Valletta, Owonikoko was leading the line with admirable commitment, always putting the pressure on the Birkirkara defenders. On the cusp of half-time, Barry laid the ball to Fenech but this time the City captain's shot was off target. Birkirkara stepped up their game after the change of ends. Inside the second minute of the second half, Rowen Muscat passed to Haruna on the left wing and the latter's cross was met by Jhonnattan whose header ended just over the bar. Revishvili denied them an equaliser when repelling Haruna's screamer after the latter had been sent through by Rowen Muscat. From the ensuing corner, taken by Jhonnattann, the ball reached Zach Muscat who hit wide at the far post but referee Fyodor Zammit pointed to the spot after Caruana was adjudged to have pulled Alejandro Mendoza. Haruna marched towards the spot and coolly drove the ball home as Revishvili dived the wrong way. The force was with Birkirkara whose unrelenting pressing forced Valletta to commit many errors, especially in their passing. Revishvili did well to beat away Fenech's thunderbolt but, against the run of play, Valletta scored. A free-kick by Briffa was deflected towards the edge of the area where Barry summoned a ferocious drive that gave Haber no chance. Cue ecstatic celebrations among the City faithful. Lifted by his goal, Barry almost struck again when he forced his way into the Birkirkara area but his drive sailed wide. It was Valletta who came close to sealing the issue as Fenech sped into the box but his angled effort was wide. Birkirkara's Fenech was high with an attempt from outside the box. As the end of the game loomed, Birkirkara intensified their pressure. They created as fine passing move with Haruna again involved before the ball was dinked out to Fenech whose inviting cross was cleared but only as far as Rowen Muscat whose first-time scorcher finished high and wide. There was another scare for Valletta when, after another intelligent run by Fenech, the ball fell to the relentless Haruna in the box but the Nigerian's stinging drive was stopped by Borg. Fenech, the Valletta captain, was named BOV player of the match.